Discussion in 'Hardware Discussion & Support' started by IvanV, Jan 22, 2019. Hi guys! As you may know, I just got a new (to me) Radeon RX 580, which works great, knocks on wood, but seems to have left some of the older tech behind, namely, VGA monitors. I have two monitors which I use. The newer one connects via DisplayPort, so that one is fine, but the older one is VGA only. That wasn't an issue with the older card, I just used a DVI to VGA adapter and all was well, but when I tried the same with the newer card I was perplexed when I couldn't physically plug the adapter in, so I finally took a better look, saw that the DVI port on the new card actually lacked a few pins and realized that it was digital only. To quote a great man, doh! Is there anything I should be aware of? My guess is that it's a good enough solution, as I got a similar one with my laptop (only that one is miniDP to VGA) and it works fine. This must be a very old monitor. DVI-D was a thing 15+ years ago. 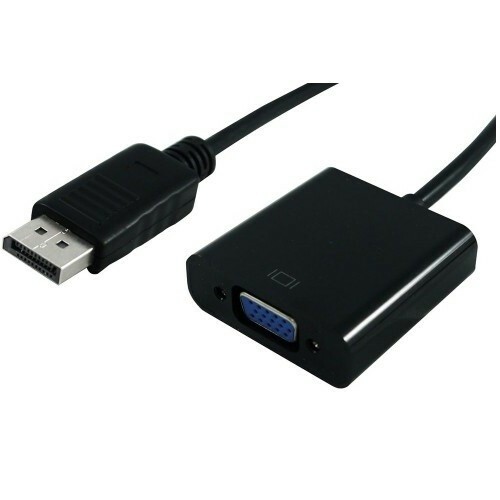 I never tried to connect a VGA monitor to a non VGA connection so I can't really suggest anything. Outside (possibly) of cost, wouldn't be better to replace the monitor with something this side of Blade Runner? LOL, yeah, come to think of it, I had my last graphics card for exactly 4 years, and the previous one for around as much, and then the one before that for about a year and a half, which is about the time I got the monitor, so it is approximately 9 years old. On the other hand, it's a 1920x1080 monitor that works pretty much as well as the day it was bought, so, for now, it's a keeper. It sounds like you've gotten fond of it. DP to VGA works fine... i've a startach and monoprice currently attached to the nvidia 1050 i've in this pc i'm using at work. Since the RX 400 series launched and Nvidia's 1000 series gpus... VGA was killed officially. Much of that has to do with the HDCP requirements now being mandatory among other things. It's expected the DVI will be eliminated entirely from either this coming generation of cards if not the following. Display port, HDMI and USB-C will be the only connections available, outside of Thunderbolt 3 potentially soon, however doubt it since USB C effectively can do thunderboard 3 soon via adapter. If you're wondering WTF with usb-c.... USB-C connected displays are becoming popular as the power provided is sufficient and it works well with up and coming VR headsets as a means to carry video, data, power all in a tiny connection. Just to give a follow up, I got a fairly nondescript (as they mostly are) DP to VGA adapter and it works fine, I have zero complaints about the image quality. I was a bit concerned because, as far as I understand, these are all active converters which take the digital signal from the DisplayPort and generate the analogue one using just the power which they get from the video output connector, so I wasn't sure if all of them are capable of providing a decent FullHD, 60Hz analogue signal (in the olden days, it was a tough task even for some graphics cards with native VGA outs, until everyone got decent 350MHz+ RAMDACs), but the one I got is fine. the power provided over DP and USB-C is pretty sufficient, and active adapters will become a necessity, though HDMI has it's own clock generator, apparently later hdmi specs may no longer require it, this is why you can usually hook up a 1 or 2 displays via a dvi and hdmi, or 2 hdmi, but anything more and it requires active adapters, as most cards only have 2 clock generators these days. The "ramdacs" inside the active adapters are pretty simplistic and small, modern technologies have provided a means to pump the necessary refresh rates out through them, 60hz is most common, some of the more expensive ones can do 120-144hz, but are hard to come by now.